As a Co-President and Communications Manager of the Rutgers Postdoctoral Association (PDA), it is my mission to help develop and support the postdoctoral community at Rutgers. I was appointed to this position in August 2018 and have been working with the rest of the Executive Board to increase community engagement among postdoctoral associates and fellows. In the past, the PDA has focused largely on events that are either strictly social, such as happy hours, or purely academic, like grant-writing events. ​One of the great accomplishments of the 2018-2019 Postdoctoral Association Executive Board has been to merge these two objectives, which we did with the revitalization of the traditional "Postdoc Symposium". For its first 9 iterations, this event was formal and impersonal featuring concurrent sessions which divided participants and research sessions which did not serve discussion between fields. 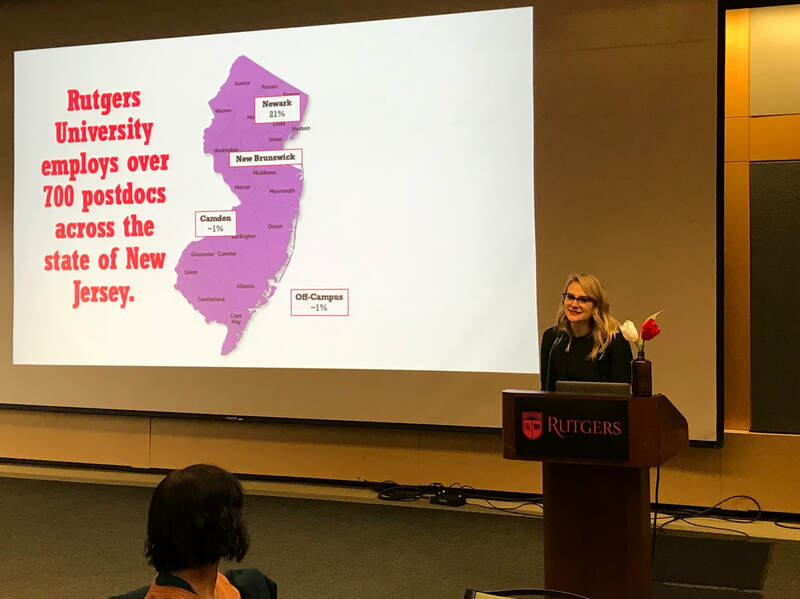 The 10th Annual Rutgers Postdoc Symposium, held in March 2019, featured three dynamic speakers who led workshops for career development and a number of informal postdoc "flash talks" to encourage the dissemination of information to audiences outside the speakers' fields. The event wrapped up with a reception to allow postdocs to socialize with all of their new colleagues and faculty from the university. Like any other academic department, Penn State's Department of Food Science has a lot going on at any given time between the Graduate Program, Undergraduate Program and our wide variety of extension-based workshops. As a peer-elected Graduate Student Representative from 2014 to 2017, I took pride in my responsibility to communicate the ongoings of the department to my fellow graduate students as well as organize and lead extracurricular and social activities among the cohort as a whole. After all, happy students are productive students! With the help of the Schreyer Institute for Teaching Excellence, food science graduate students were invited to maximize their TAing experience with teaching techniques that minimize the amount of time spent on teaching assistantship assignments outside the classroom. Topics included improvement of grading efficiency by writing and using rubrics for a variety of assignments and learning how to communicate effectively with students about scientific concepts as well as assignment expectations. Students were given the opportunity to learn from the experiences of others in a Q&A panel with early-career professors from the Department of Food Science. Discussion focused on significant experiences that our panelists had as grad students and postdocs, their decision to stay in academia versus industry, and the process of applying for and beginning a career as a professor at a major research university.